The Cow Watches are coming to Chick-fil-A Kid’s Meals! During the holidays Chick-fil-A Kid’s Meals are featuring the never before seen Cow Watches to reach families with a simple and fun message: In your busy holiday season make sure to stop and take a few moments together as a family to spend quality “time” with one another. 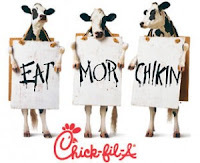 One FREEISMYLIFE reader will win a Chick-fil-A 2012 Calendar with FREE coupons for Chick-fil-A all year round! A $30 Value - HOLLA to the FREE! - The contest ends on Wednesday, November 23, 2011 at 11:59am EST. - Prize will be fulfilled to the winner by DBA West. No P.O. Boxes please. - You can get 1 extra giveaway entry for answering the Chick-fil-A question at this link. - You can get 1 extra giveaway entry for tweeting the following message on Twitter "I entered the @freeismylife giveaway to win a Chick-fil-A Calendar with $30 in coupons http://bit.ly/ul35gO "
Disclosure: The giveaway prize will be provided by DBA West. Random.org has spoken! Out of 118 entries, Random.org has picked #80. Congratulations to the winner of the Chick-fil-A 2012 Calendar with 12 months of coupons worth $30 - Karen of Liberty City, OH !! !